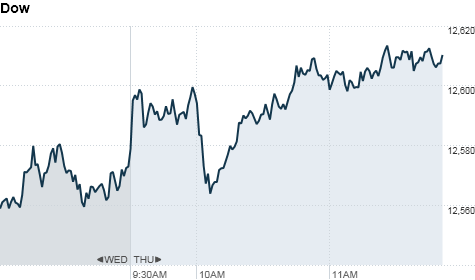 NEW YORK (CNNMoney) — U.S. stocks advanced for a third straight session Thursday, as investors welcomed a slew of positive news on both the earnings and economic fronts. The Dow Jones industrial average (INDU) added 35 points, or 0.3%, the S&P 500 (SPX) rose 7 points, or 0.5%, the Nasdaq composite (COMP) increased 23 points, or 0.9%. Morgan Stanley (MS, Fortune 500) posted a loss, but it wasn’t as deep as analysts had expected, and shares of the bank surged almost 6%. Meanwhile, the government released an onslaught of economic data, including reports on housing, unemployment claims and inflation. Investors were encouraged as initial jobless claims fell to their lowest level in nearly four years, in another sign of improvement in the long-suffering labor market. However, concerns that the sharp drop may be one-time blip rather than a start of a new trend kept a lid on gains, said Vernon. “Traders are concerned about seasonality factors, and worried that claims could return to the status quo over the next coupe of weeks, so they’ll wait to see what happens,” he said. U.S. stocks advanced to finish at six-month highs Wednesday, as investors welcomed the International Monetary Fund plan to boost its bailout fund and contain Europe’s debt crisis. Investors remain focused on Europe’s crisis this week. Early Thursday, Spanish and French bond auctions drew solid demand, calming some fears about Europe’s ability to fund its debt. Greek officials will continue talks with the group representing private-sector investors and banks Thursday in an attempt to reach an agreement on the size of the writedown these creditors will take. No accord has yet been announced, but the creditors’ representative says one may come in the days ahead. World markets: European stocks finished higher. Britain’s FTSE 100 (UKX) ticked up 0.7%, the DAX (DAX) in Germany rose 1% and France’s CAC 40 (CAC40) added 2%. Asian markets ended notably higher. The Shanghai Composite (SHCOMP) and the Hang Seng (HSI) in Hong Kong both climbed 1.3%, while Japan’s Nikkei (N225) gained 1%. Economy: The government released December data on inflation, building permits and housing starts, as well as its latest tally of weekly jobless claims. The Labor Department reported that 352,000 people filed for initial unemployment benefits last week, down sharply from a revised reading of 402,000 claims in the previous week. It is also the fewest number of people filing for jobless claims since the week ending April 19, 2008. Is Romney’s effective tax rate lower than yours? Consumer prices held steady last month, largely due to declining gas prices. The government’s key measure of inflation, the Consumer Price Index, showed prices were virtually unchanged from November to December. The index for items minus food and energy rose 0.1% in December, after rising 0.2% in November. Housing starts fell 4.1% in December, to an annual rate of 657,000 units. Building permits slipped 0.1% to an annual rate of 679,000. The Philadelphia Fed Index showed that manufacturing activity continued to improve in January in the mid-Atlantic area, rising to 7.3 from 6.8 in December. Companies: Bank stocks gained traction in early trading, with shares of Goldman Sachs (GS, Fortune 500) rising more than 2%, a day after the firm reported earnings that beat estimates. Citigroup (C, Fortune 500) and JPMorgan Chase (JPM, Fortune 500) both filed disappointing results in the past week, while Wells Fargo (WFC, Fortune 500) reported solid earnings. Eastman Kodak (EK, Fortune 500) filed for Chapter 11 bankruptcy protection Thursday. Once a component of the Dow Jones industrial average, the company was recently trading around 39 cents a share. UnitedHealth Group (UNH, Fortune 500) reported fourth-quarter earnings that beat forecasts. Some of the nation’s biggest tech firms will report their corporate results after the closing bell Thursday, including Google (GOOG, Fortune 500), IBM (IBM, Fortune 500), Intel (INTC, Fortune 500) and Microsoft (MSFT, Fortune 500). Google is expected to post robust earnings of $10.49 a share, up from $8.75 a year earlier. Microsoft’s earnings are expected to remain essentially flat compared to the prior year, at 76 cents a share. IBM’s earnings per share are projected to climb from $4.18 a year earlier to $4.62. Currencies and commodities: The dollar fell against the euro and British pound, but edged higher against the Japanese yen. Oil for February delivery added 41 cents to $101 a barrel. Gold futures for February delivery ticked down $3.90 $1,656 an ounce, losing momentum from earlier gains. Bonds: The price on the benchmark 10-year U.S. Treasury fell, pushing the yield up to 1.98% from 1.90% late Wednesday.